Whales from the deck of the Puffin and the Loon! July 2017....What an extraordinary summer we have had. 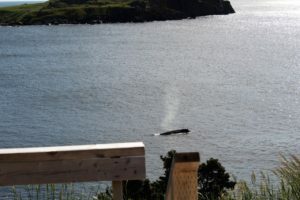 The humpbacks woke me up at about 130 am in the morning....it is a funny thing - you wait and wait for the capelin and the whales....and then suddenly there they are! it is pretty tough to return to sleep when you know they are amassing in the waters just outside your window! and for three weeks now it has been the same! 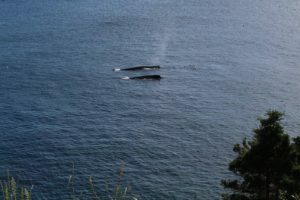 Every day whales in numbers unseen, in proximity that leaves you useless for anything other than sitting and watching. I have decided that life is like whale-watching -- if you don't sit still and observe - you will miss the greatest of life's experiences. Ultimately I will post more than my own little video and photos here. Even so - I think what you see through my iPhone lens will be enough to leave you wanting more. Here is what Newfoundland and Labrador Tourism has to say about Whale Watching in the local area. And there is no denying that the photos they post are enough to have you scrambling to come here! i have taken quite a few videos with my humble iPhone - these will give you an idea of the location of Whale Watcher House and its proximity to those whales. and if that wouldn't entice you - have a listen to the audio on this brief clip!